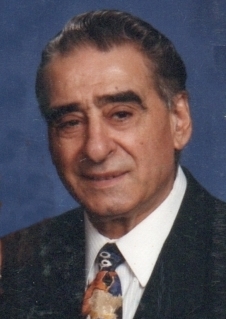 Livio Pelosi, age 93 of Massillon, passed away Wednesday, September 5, 2018 at the House of Loretto in Canton. He was born July 9, 1925, in Brewster the son of the late George and Maria (Cianfarini) Pelosi. Livio retired in 1988 from Norfolk & Southern after 40 years of service, where he was a foreman. He was a member of St. Joseph Catholic Church, a volunteer for the K of C Hot Lunch Program, Massillon Senior Center. Livio was a gifted artist and musician and often performed with his accordion at various events. Livio is survived by daughters, Paula (Bruce) McBrian, Patricia (Phillip) White, Anna Boylan; sons, Robert Pelosi, George (Rachel) Pelosi; and grandchildren; Anthony, Angela, Gina, Ryan, Vince, Tessa, Carlo, Emily, Joey, Annie, Tony, Stella and Nina. He was preceded in death by his wife, Antonina (Firmi) Pelosi and brother Gabriel Pelosi. Mass of Christian Burial will be held on Tuesday, September 11, 2018 at St. Joseph Catholic Church, 322 3rd St SE at 11:00 am with Rev. Raymond Paul officiating. Calling hours will be held on Monday, September 10, 2018, at Heitger Funeral Home - Jackson Chapel, 5850 Wales Ave. N.W., Massillon, from 5 to 8 P.M.
Burial to follow the service at St. Joseph Cemetery in Massillon. In lieu of flowers donations may be made to American Heart Association, 7272 Greenville Ave., Dallas, TX, 75231 . Condolences to the family may be made on the tribute wall here at this site.